Finland recognized Russia as the legal successor to the Soviet Union on December 30, 1991. January 1992 witnessed the Russian-Finnish treaty on the fundamentals of the relations being signed, with the treaty extended until 2007 in 2001. There are over 80 interstate and intergovernmental agreements in effect between Russia and Finland, governing virtually all aspects of the bilateral relations. Finnish Presidents Martti Ahtisaari and Tarja Halonen paid official visits to Russia early in their terms - May 1994 and June 2000, respectively. Russian President Vladimir Putin paid an official visit to Finland on September 2-3, 2001. Contracts were signed by Russian holding company Interros and Finnish company Outokumpu within the framework of the economic program of the visit. High-speed train operations were discussed proactively too. May 19, 2002, President of the Finnish Republic Tarja Halonen came to St. Petersburg on a private visit timed to the ceremony of consecration of the Finnish Evangelical/Lutheran Church of St. Mary. On her one-day visit, President Halonen attended the Little Mom under-age mother social assistance station being provided with humanitarian and financial aid by Finland, and the Almus orphanage. An official visit of Finnish President Tarja Halonen to St. Petersburg took place on May 26-27, 2002, during which the Finnish and Russian presidents held talks. 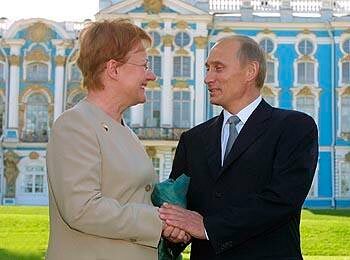 On October 5, 2002, Russian President Vladimir Putin held negotiations in St. Petersburg with President of the Finnish Republic Tarja Halonen who was in Russia on a two-day working visit. May 30-31, 2003 saw the Finnish president in St. Petersburg, participating in the Russia-EU summit meeting and celebration of the 300th anniversary of St. Petersburg. On June 28-29, 2003, Ms. Halonen made a private trip to the Arkhangelsk Region. On November 24, 2004, a private visit of the Finnish president to St. Petersburg took place, during which she met with St. Petersburg's Governor Valentina Matvienko. Ms. Halonen participated in the ceremony of inaugurating a new building of Finland's consulate general in St. Petersburg. The heads of the Russian and Finnish governments meet two or three times a year. Finnish Prime Ministers Paavo Lipponen, Anneli Jaateenmaki and Matti Vanhanen have been repeatedly to Russia on working visits. Russian Prime Minister Mikhail Kasyanov visited Finland in 2001, 2002 and 2003. There were talks between Russian Prime Minister Mikhail Fradkov and his Finnish opposite number Matti Vanhanen held in Moscow on May 24, 2004. During the talks, the parties closely examined the cooperation "within the context of interaction between the EU and Russia." The talks focused on deepening the trade and economic cooperation between the two countries, particularly, they dwelt on implementing large-scale joint programs and outlined strategic tasks to be tackled in the future. Cooperation between the foreign, interior, economic development and trade and transport ministries as well as customs and border guards of the two countries has been developing with success. There is an informal association of State Duma deputies, called Group on Contacts with the Finnish Parliament. There is also the Russian Friendship Group in the Finnish parliament.